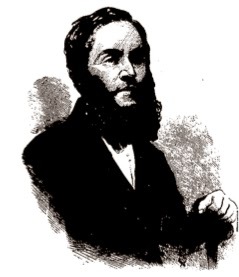 In 1859, Henry Jumpertz was arrested for the murder of Sophie Werner. It seemed like an open-and-shut case. A barrel had arrived in New York that smelled so terrible that authorities had to open it up. Inside, the first thing they saw was a woman’s face. It was all green and blue and decomposed, but still recognizably a face, and piled on top of a whole bunch of other guts and body parts. The barrel was easily traced back to Henry Jumpertz, who ran a barber shop at Dearborn and Randolph. Jumpertz’s story didn’t make him sound all that innocent – his story was that Sophie, his mistress, had hanged herself, and, fearing that he’d be arrested for murder (being an immigrant made him an easy target), he’d decided to chop the body into pieces, disposing of some of it in the snow before sealing the rest into a barrel, which he kept next his bed for the next two weeks. Naturally, he was arrested for murder. Frank Leslie’s Illustrated Newspaper said that “what he has confessed of shows him capable of any enormity.” He was quickly convicted, despite a suicide note written by Sophie that was held up as evidence that it hadn’t been murder at all. Jumpertz, only 24, was at other times described as a model prisoner, even helping to design a new sort of gallows on which he could be hanged. But expert analysis got him off the hook – at the last minute, it was determined that the handwriting on the suicide note was really Sophie’s, which makes it a bit of a landmark case, since no one, so far as anyone could tell, had ever used that sort of forensic handwriting analysis in court before. The case was a big enough deal to inspire the book at the left, which was mostly made up of copies of Jumpertz’s letters that had been rounded up. I’ve never seen a copy of it, though copies exist in a couple of university libraries. It may have been Chicago’s first true crime book. Whether Jumpertz was guilty is still debated occasionally (his name comes up in discussions of how abortions were portrayed in the 19th century – he apparently told one woman he’d impregnated that he’d marry her if she had an abortion), as well as discussions of handwriting analysis. It’s often said that his various girlfriends were always regarded as having been led astray while Jumpertz was portrayed as a terrible libertine, but I see pretty much the same pattern one usually sees in mid 19th-century immigrants who are convicted with murder: they portrayed him as the biggest monster alive at first, but as his hanging date came closer and closer they started talking about his intelligence and how calmly he was awaiting death. After he escaped the gallows, the press pretty much forgot all about him, outside of a stray mention of him serving in the union army some years later. After his release, he did join the Union Army; he was a sergeant in Vicksburg in 1862 during the Civil War. Some early reports claim he died in the war, but pension records have him alive (though an invadid) in 1875. Are Bodies Buried Beneath Comiskey Park?